Speaking exclusively to The Independent on Sunday, Goncalo Amaral denied cashing in on the tragic disappearance of the three-year-old but said he was determined to restore his reputation, which “had been torn to shreds” by unfair and inaccurate media reports. Not cashing in by writing a book that is then placed on sale for a fee. Why not just publish his thought on a website, and distribute it for free? 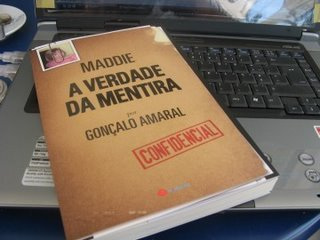 The book, Maddie: The Truth about the Lie, has already sold an estimated 180,000 copies in Europe, and Mr Amaral’s representatives are trying find a British publisher. Anyone brave enough to publish it?